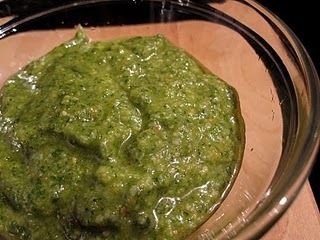 The more I talk to people I learn that, while most know what pesto is, they have no clue how to make it. When I try to explain that it’s easy, they think I am nuts. Honestly, if you have a food processor, this is a snap – PLUS, you will impress everyone and you can’t even mess it up. In a food processor, pulse the basil and garlic about 5-7 times. Then add the nuts and continue to pulse the mixture another 4-6 times. With the food processor on low, slowly drizzle in the oil until it is all combined; then shut it off. Add the cheese, and pulse 3-5 times until it has just incorporated. Done. You can now toss your pesto with cooked pasta, add it to chicken, use it as a pizza topping, make Pesto Pea Salad, or . . .
**To toast the nuts, put them in a dry (no oil) pan over low heat and shake them every couple of minutes to prevent burning. This will take a little while – keep your eye on it! You will know they are done when they get a light brown color (and smell really good). Also, make sure to keep any extra pine nuts in the fridge.